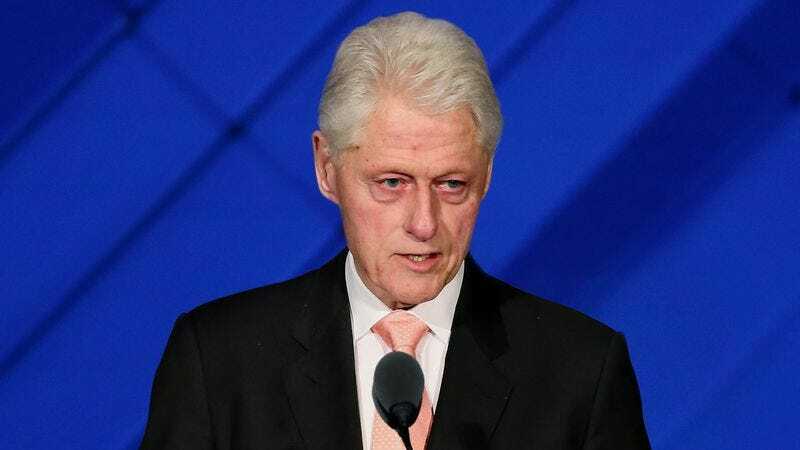 PHILADELPHIA—Waiting anxiously for the former president to address what was clearly on the minds of everyone in attendance, sources in the Democratic National Convention audience Tuesday night expressed hope that Bill Clinton would break the tension during his speech with a joke about how utterly awful he looks. “The longer he goes without casually jabbing at his gaunt, feeble body or how droopy every part of his face is, the more uncomfortable it becomes,” said Colorado Democrat Patrick Dubourg, adding that the 42nd president could have at least said something about his hair and makeup person doing an “admirable job, given the circumstances.” “You’d think he might lightheartedly compare his body size from when he was in office to the sort of shriveled-up husk he is now, or maybe thank the crowd for waiting so long while he shuffled up to the podium, just to lighten the weight in the room—but nope, he launched right into praising his wife’s record without so much as mentioning the obvious. Man, this is hard to watch.” At press time, Dubourg had reportedly decided to close his eyes while Clinton spoke and try his best to imagine it was 1992.